I consider parody to be somewhat pathetic, a pointless puerile exercise only undertaken by pathetic, pointless people. Well I did think that until the awe inspiring Heartland Institute told me to believe otherwise. A turn of events has unfolded. A Master of Puns, a punisher if you will, has descended upon the warmist blogs and unleashed cleverly named parodies to ridicule them. http://www.desoggybog.com/ is the main parody, it is very witty and very subtle indeed, but believe me it is a parody. No really, it is. ExxonSecrets.org is parodied by http://www.extrasillysecrets.org/ and SourceWatch.org by http://www.coursewatch.org/. Just who is the genius who came up with these clever slights on names? Coursewatch. Genious. I bet they are mad to have their names mispronounced like that. And the blog content is so vivid and lifelike too! I wonder where they got the idea of using parody as a means of ridiculing blogs? I only wish I had thought of it first. I am late to the party, but it's not too late to join in. So in honor of desoggybog, extrasillysecrets and coursewatch, I made a parody blog of the same caliber. What I basically did was think long and hard about my target warmist blog, long and hard about the flaws in their arguments and long and hard about a load of names I would call them. There is a fine line between critique through imitation and just sounding plain pathetic. Fortunately desmoggybog avoids the line altogether and I believe my effort ReallySillyStupidClimate does too. 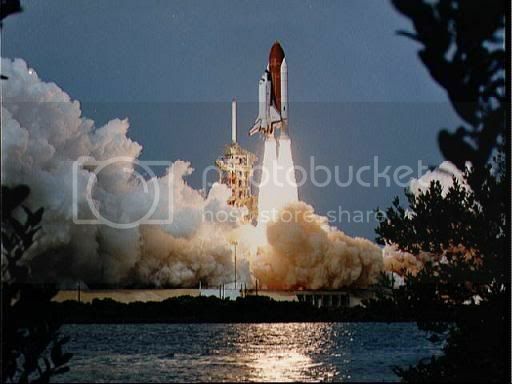 A rocket launches from NASA CRU's GISTEMP headquarters. Can it really be right for such launches be to made in such close proximity to important climate data? Over the weekend NASA's University of East Anglia has alleged hackers have "stolen and released" a bunch of scientist's emails. However what makes me deeply suspicious is the complete lack of correspondence with Al Gore in these released emails. Where are all the emails showing Al Gore's involvement? Even more bizarrely there is no plotting and planning on how to raise taxes. I don't see any mention of the socialist new world order that these scientists are trying to bring about. Not once do they talk about how to best achieve wealth redistribution or world government. So I have to conclude this this email release is a big con. It has all the hallmarks of a deliberate leak to make these scientists look better and to try and silence skeptics who question their motives. If we are to believe the emails, the scientists don't actually think their work is in error! But we know they must realize it's all a big con, so how can these emails possibly be true? October temperature release draws near. How about you just reuse the Sept 2008 temperatures? I figure that way it will make it the warmest October on record! Al says this will be an excellent move for his stock portfolio. btw I don't know what to do with all that grant money coming through my door, it is starting to fill up my front hall. I bought 5 more Ferrari's and a yacht, but it isn't reducing it much. That is the kind of thing I was expecting to find. Blog science and the Heartland Institute have provided plenty of discussion to lead me to believe the above kind of emails should exist. But all I could find was some BS email in which they talked about OctoberGate as if it was just some error in russian data. They even had the tenacity to add in a note that skeptics wouldn't believe it was just an error. A likely story! It's clear to me that the emails are fake. 450 Peer-Reviewed Papers To Support Your Arguments Against So-Called "science"
Some books. 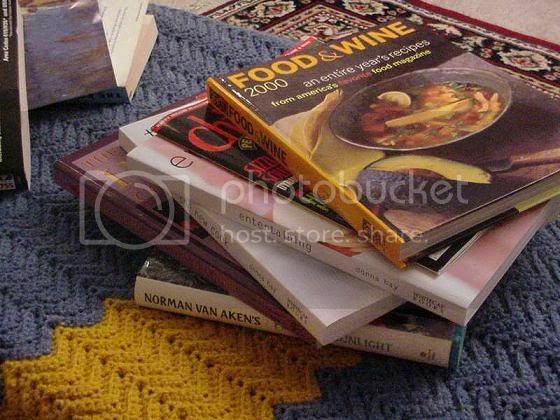 Yes I know they are not the peer-reviewed papers in question, but if other blogs got away with a photo of a few folders I think I can get away with a photo of a few books. 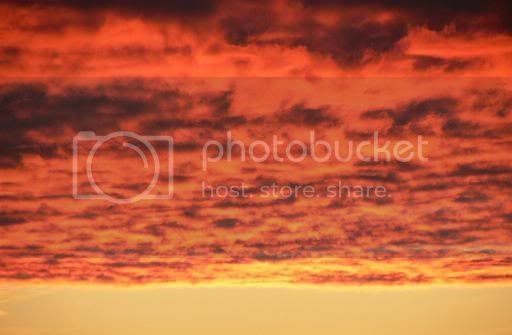 At least my image is public domain. Bear in mind these 450 papers are the tip of a growing iceberg that refuses to melt, so in a way this is yet more evidence of cooling. The 450 only includes a small sample of total papers supporting skepticism because we know there are at least 30,000 scientists skeptical of manmade global warming on the Oregon Petition and I find it hard to believe they haven't all published at least one paper each. The list also doesn't include peer reviewed blog posts or peer reviewed blog comments. Usually peer review is a sign of "team science". We spit on "peer review", it's not perfect so it doesn't meet our high standards of absolute proof. But in this case peer review is a sign that these papers carry authority because the peers are skeptics. Some of them have even been published in the high impact journal Energy and Environment, the journal that climate "scientists" can only dream of being published in. The benefit of the list is that you don't have to read them, you can just copy paste the entire list all over the internet. But if you do want to read some of the papers on the list you should take the following advice to make sure you don't do it wrong. Never read papers in context of other papers. This is the mistake warmists make. Global warming skeptics know that reading papers is not an exercise in understanding the state of the science, but an exercise of finding spanners to throw in the wheels of manmade global warming. Find some nice arguments to bash warmists with but for heavens sake don't analyze the arguments in context of other papers. They are all good arguments to support our skepticism if taken individually, but not if you think about them all at once. Try to divide the arguments into separate compartments in your head so they won't merge into one another in a baffling contradiction. You can still throw all of the above arguments at warmists, it's bound to confuse them. Make sure you assert the papers have "shown" or "proven" the argument is true. There are also some great political speeches in some of the papers and one uses an introduction quote by Sir Arthur Conan Doyle. Update: In error I had written "Energy and Environment, the journal that climate "scientists" can only dread of being published in". I have now corrected "dread", to "dream". This was an unfortunate typo. If you have blog expert reviewer status please take the updated version before you review, thanks. 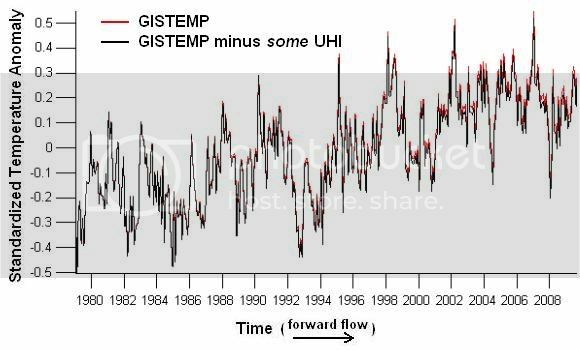 GISTEMP is the NASA GISS global temperature surface record and it belongs to James Hansen. People sometimes ask why climate skeptics criticize GISTEMP so much? Well it started off as a hunch, we felt that if our arch nemesis James Hansen was running it, it must be wrong. If this was merely politics that would be all we needed to believe it was wrong. But this is science and science demands evidence, so dutifully we sought out evidence to back our conclusion. Here I bring together all the lines of evidence we have manufactured and furthermore I show how GISTEMP would look after corrections. The first piece of evidence is a simple observation. Since 1979 satellites have been measuring the temperature of the lower atmosphere. GISTEMP is trying to measure the temperature of the surface. The surface and lower atmosphere are not exactly the same thing, but you'd expect the temperature trend in both to be somewhat similar. 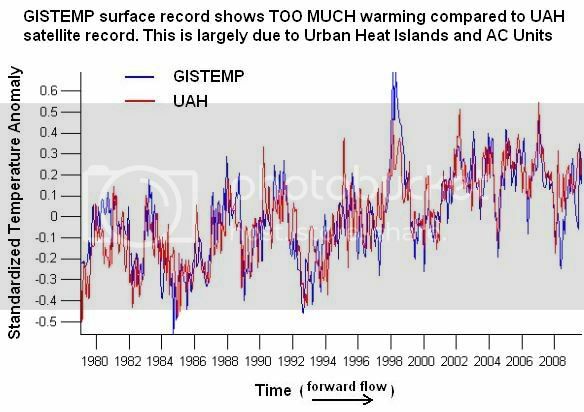 But look at how GISTEMP shows far more warming than the UAH satellite record. The disagreement is astronomical. This is what Blog Science has been banging on about for years! Warmists will tell you there is no such thing as the urban heat island effect, but that's a complete strawman because their very own studies say there is an urban heat island effect. In fact they even try to correct for it in GISTEMP! As Blog Scientists we must assume they don't correct for UHI enough. Blog Science knows that GISTEMP is contaminated by UHI bias. 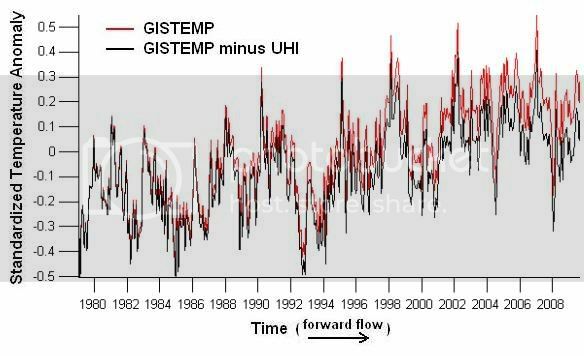 In the following graph I correct GISTEMP for UHI by 0.01C/decade. If this was the full magnitude of UHI contamination that Blog Science was suggesting we would be just making a big deal about nothing! Don't worry we aren't. So obviously we must be talking about a far bigger correction being needed. 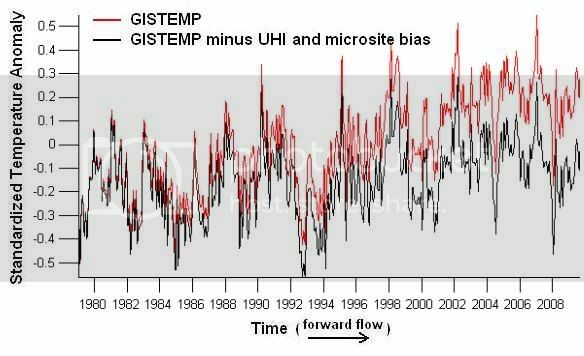 Lets try correcting GISTEMP by 0.05C/decade for UHI bias. That's more like it. We can now see that the allegations against GISTEMP not correcting for UHI make a big difference! The surface record relies on sensors. Sensors are uncannily aware of the tidiness of their surroundings. They are very partial on having nice tidy surroundings and being checked on by men in smart lab coats. If these conditions are not met they refuse to measure temperature properly and just spin around, warmer and warmer, out of control. It has been proven by Blog Science that James Hansen hasn't personally kept all the sensor locations tidy. In fact noone seems to have bothered and tourists have left rubbish like barrels and boats lying around, items known to cause warming trends. Even worse some people have installed AC units near sensors. Blog Science knows that by installing an AC unit or a boat next to a sensor, that sensor will read ever higher temperatures each year until eventually the sensor will melt. Warmists claim that the GISTEMP algorithm statistically detects and removes such significant biases from the record. But as Blog Scientists we assume otherwise. We also demand to know why science isn't performed like in the movies? Why aren't there teams of good looking men and woman scientists in shiny suits going around in futuristic metallic science vans tidying up the sensors? Blog Science can only conclude that microsite biases are not properly accounted for in GISTEMP and that these biases cause GISTEMP to be too warm. Like with UHI bias the microsite bias must be somewhat large or else we would just be making a big deal about nothing! So I propose another correction of 0.05C, this time for microsite bias. The following graph shows the total correction (0.1C/decade) for UHI bias and microsite bias. We see that correcting for UHI and microsite bias has reduced the warming a lot! So much for the IPCC's predictions of children melting within 20 years. 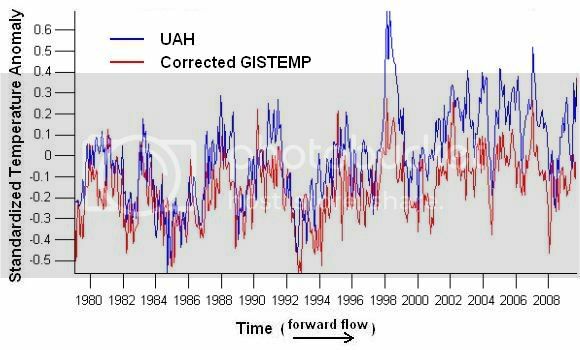 Now lets compare the corrected GISTEMP to UAH satellite record again. The following graph shows that the previous disagreement between GISTEMP and the satellite record has disappeared thanks to our Blog Science efforts. It has been replaced with a new disagreement though. Now the satellites show too much warming. The conclusion is obvious. It is time for Blog Science to attack the reliability of the satellite records. Met Office Hadley Admits Surface Record Is "Incorrect"
A substantial proportion of the September CLIMAT monthly land station summary report data that was sent over the GTS (Global Telecommunication System) was obviously incorrect. For the past few weeks we have been liaising with the sources to gain a version that was correct. As this issue affects a substantial portion of the globe we are not in a position to release a 'global' estimate. Nor will we do so until we are satisfied that an adequate amount of verified data is present. Just as I expected they are too busy "validating" the data to bother releasing it. Why not release it and let Blog Scientists search for errors? We can publish our results in the Telegraph and in an article on the Register, both Journals with a history of fair-handed reporting on the subject. I can only guess what "liaising with the sources" means. Sounds a lot like a metaphor for "team science"
Can the IPCC finally be disbanded now? HadCrut3 - Where the **** is my data?! Where is the September temperature update?! It's now November. This is intolerable having to wait over two months for data. Where is it? You can tell I am angry! I need this data immediately for Blog Science Auditing. I hope they aren't wasting time validating the data before they release it. I just need the data, if there's any errors in it I am sure it can be corrected shortly after release without fuss. As this is a top science blog, why not post me your own suggestions of what the Hadley Climate Center could be doing? Remember now is the season to tie every paranoid thought to Copenhagen somehow. I'll kick you off: Are they too busy installing their fake tree rings in Siberian forests?